The Vatican City is home to the Roman Catholic Church headquarters. There you will find the central government for the Church, the Bishop of Rome, otherwise known as the Pope and the College of Cardinals. 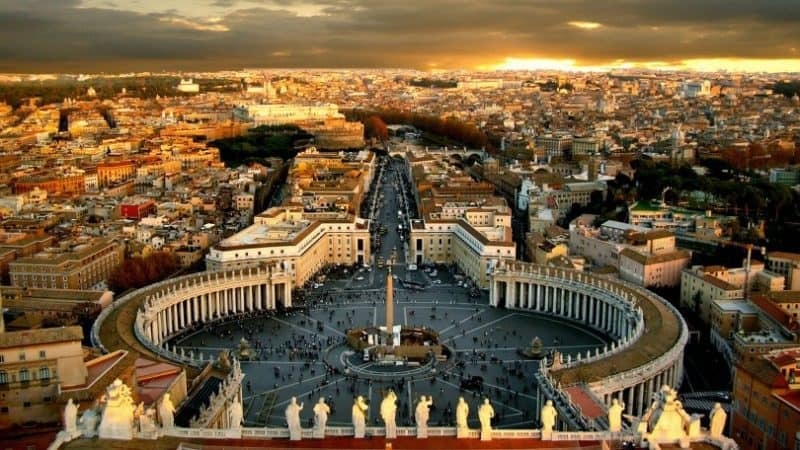 Every year millions upon millions of people travel to the Vatican City, primarily to see the Pope but also to worship in St Peter’s basilica and to view the wonders that are stored in the Vatican Museums. Technically speaking, the Vatican City is a country, an independent city-state and is the smallest in the whole world. The Vatican City’s political body is governed by the Pope but, and not everyone knows this, it is many, many years younger than the Church. As a political body, the Vatican City has been classed as a Sovereign State since 1929, when a treaty was signed between the Kingdom of Italy and the Catholic Church. That treaty was the end result of more than 3 years of negotiations on how certain relations should be handled between them, namely political, financial and religious. Although the negotiations took 3 years, the dispute actually began back in 1870 and neither the Pope nor his cabinet would agree to leave the Vatican City until the dispute was resolved. That happened in 1929 with the Lateran Treaty. This was the defining point for the Vatican as it was this treaty that determined the City as a completely new entity. It was this treaty that split the Vatican City from the rest of the Papal States that were, in essence, most of the Kingdom of Italy from 765 through to 1870. Much of the territory was brought into The Kingdom of Italy in 1860 with Rome and Lazio not capitulating until 1870. The roots of the Vatican City go back much further though. Indeed, we can trace them back as far as the 1st Centruy AD when the Catholic Church was first established. Between the 9th and 10th Centuries right on through to the Renaissance period, the Catholic Church was at the top of its power, politically speaking. The Popes gradually took on more and more governing power eventually heading up all of the regions that surrounded Rome. The Papal States were responsible of the government of Central Italy until the unification of Italy, almost a thousand years of rule. For a great deal of this time, following their return to the City in 1377 after an exile to France that lasted 58 years, the reigning Popes would reside in one of a number of palaces in Rome. When the time cane for Italy to unify the popes refused to recognize that the Italian King had a right to rule and they refused to leave the Vatican. This ended in 1929. Much of what people see in the Vatican City, the paintings, sculpture and architecture, was created during those Golden years. Now revered artists, people such as Raphael, Sandro Botticelli and Michelangelo made the journey to the Vatican City to pronounce their faith and their dedication to the Catholic Church. This faith can be seen in the Sistine Chapel and St Peter’s basilica. Today, the Vatican City remains a religious and historical landmark, as important now as it was then. It receives millions of visitors from all around the world, visitors who come to see the beauty of the City, to take in its history and the culture and to express their belief in the Catholic Church. The influence and the power of the Vatican City were not left in the past though. It is the center, the heart of the Catholic Church and, as such, because Catholicism is still one of the single largest religions in the entire world, it remains as a highly influential and visible presence in the world today. In between the priceless art houses in the Museums, the beautiful architecture that is St Peters Basilica and the religious significance of the Pope, the Vatican City has become one of the most popular destinations in the world for travelers. It is the embodiment of some of the more significant parts of both Western and Italian history, opening a window onto the past, a past that lives on today. Religion has played a big role in shaping history through out the centuries. I didn’t even know catholicism was a full religion on its own. How astounding the knowledge is. If only I can have a miniscule time in the archives of the Vatican. Dream come true. It’s a blessed state. It’s not really acommon luck for any state to be under the pope’s government! we are leading big print media group (Dainik Bhasksar )of india . i required ground report for Christmas celebration of Vatican city for news publishing in india kindly share some inputs asap .